PinkNoise Studio and ReasonTalk are happy to announce the details of the PinkNoise Studio 15th Anniversary Luna Song Challenge. By submitting their entry to the competition, all participants agree to grant non-exclusive rights for their contribution (or an excerpt from it) to be presented by PinkNoise Studio on their website, SoundCloud and Propellerhead Shop page, towards the promotion of Luna Dual Performance Synth (with due credits, of course). If you do not agree with this rule, please do not participate! Moreover, by submitting a song to the competition, participants express that all sounds and samples used in their song have been cleared. Limited instrument recordings such as guitar, drums. Your song must be submitted by posting a link to it in this thread before closing time. After submitting your song you should not alter its URL anymore (altering privacy of songs on SoundCloud breaks the links compatibility). We encourage participants to use #Luna, #PinkNoiseStudio and #ReasonTalk tags when uploading entries to SoundCloud or Allihoopa. When sharing their entries on social media, if you feel so, tag @PinkNoise.Studio on Facebook, #PinkNoiseStudio (Twitter, Instagram) and @Reasontalk or #Reasontalk. Staff members of PinkNoise Studio, Reasonbanks and ReasonTalk aren't allowed to participate in this competition. Nice. Good i kept my trial for the right moment. And congratulations for 15(!) years! Last edited by Loque on 15 Mar 2018, edited 1 time in total. ...and it's a Hungarian company, too! Small country, high quality. "A magyarok istenére." Happy March 15th, too by the way! Can't wait to see what everyone comes up with. This'll be a fun one! Awesome. I've really been wanting to hear what this synth is capable of. And that's a killer first and second prize! Not that it matters to me personally, because this synth wasn't for me. But it's pretty bad timing putting the song challenge together now considering it was released in late january. A lot of people have probably already used up their trials. so i'm not going to trial new products when they come out anymore? it is a shame i cant participate in this event but good luck to everyone who can! You still can or didn't bought the fabulous product? lol i dont buy every fabulous product loque but i do enjoy entering these sound comps. We are really sorry that some of you are not able to enter as you have used your licences. Normally we do do the challenges upon release but we cannot roll back time. We hope this song challenge gives a chance to most of you and helps to thank to PinkNoise Studio for the hard work that has been done for Reason users in the last 15 years. So if you have tried it, liked it, just buy it! Hum...just checked if the post viewtopic.php?f=47&t=7505999&p=382451&h ... gy#p382451 was right, and yes, reopening the song or patch and settings are lost. The sound is good, but I wait for a fix. Yes, this bug occurs in the 1.0.3 version. Previous versions work fine. The fix is uploaded, now we're waiting for the acceptance test. In the meantime: please don't download the 1.0.3 version, wait for the 1.0.4 update! Patch initialisation bug, fixed!!! So, lets dive in this song challenge!! Ok. Thanks, Andras, for fixing this so quickly! Got another bug. 4 synths in a combi and they all have an error and are disabled when I try to bounce or export audio. This is with was before the latest update and is still an issue after the update. Thanks for reporting it, but unfortunately this is not telling me anything. Which error, what happened before Reason disabled them? Can you induce it again, save that project file and send it for checking? Yes I’ve been able to reproduce it every time. The devices playback fine. 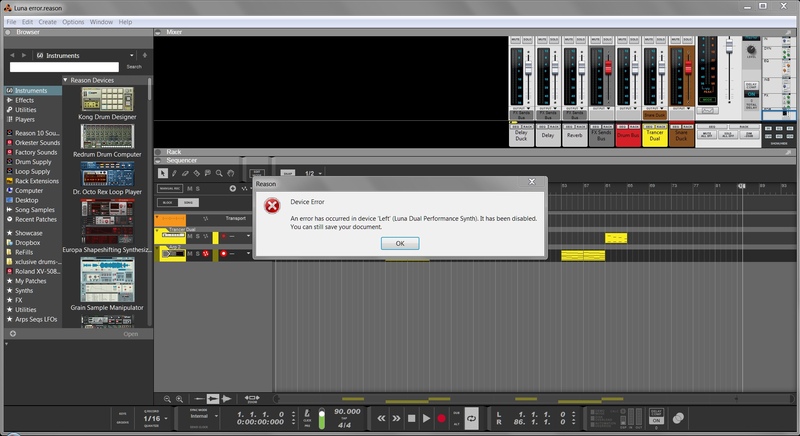 It happens when I try to export or bounce the track. Then I have to close and reopen reason to get them to play again. Here’s a song file that I have tested it with. The pop up error doesn’t give much info. But it shows the exact same popup 4 times, once for each Luna instance in the combi. Here is the patch, please replace the cmb in your song file, and let me know the result. Thanks for that but still not working. The patch you made wasn’t 1 to 1, unfortunately. Diff envelop settings and a diff waveform for osc A. When I copy the patch settings to new Lunas it happens again. Pulled them out of the combi and put them each on separate tracks and still getting the error. It plays back fine so Used them as recording sources to manually bounce them. You could try a diff on the patches. Maybe there is something odd from a previous version. That is a possibility. It was doing it before the upgrade but I had the bugged version initially. So maybe something from the bugged version is jumping over on copy/paste? I'm not a programmer so that's a very uneducated guess from me.